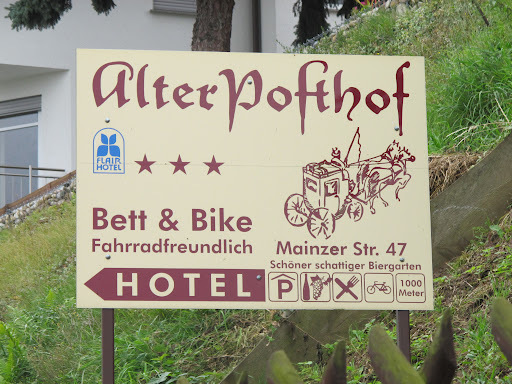 On Monday, I wrote about my experience riding a segment of the Rhine River Bicycle Route (in Germany), and while I did it for the sheer enjoyment, I also did it to see first-hand the parallels between European routes and those being developed as part of the U.S. Bicycle Route System (USBRS). The good news is that we know exactly what to do. The Swiss section of the Rhine River route. A sign of the business power of bike tourism. Local Buy-In: This has become a no-brainer along the Rhine as communities vie for the lucrative business that bike routes bring. However, there are still issues (call it "local pride") with getting communities to coordinate the look and placement of signage, as well as the development of online and print information. The Rhine River project -- along with new Euro Velo route standards -- is meant to overcome this coordination problem. In the U.S., local buy-in is a prerequisite for approval of a new U.S. Bicycle Route (USBR) and it has been exciting to see dozens of communities (for example, in Michigan) sign up in support of these routes. However, now we are doing our first signage of new routes and will be looking to the incentives and stan dards provided in Europe as possible models for encouraging consistency in signage, route facilities and information. Signage: As noted in my earlier post, signage is critical. It is always cited by cyclists as one of the top three things they consider for the quality of the route. Consistency of look and placement is paramount to an excellent bike travel experience. Again in the U.S., we are just starting but are seeing great strides along USBR 76 (aka the TransAm) and 20 (across Michigan). This is considered one of the biggest areas needing improvement on the Rhine -- and is scheduled for major upgrades in 2013. The Rhine River signage system will be substantially upgraded next year -- while the U.S. gets going on its route network. Monitoring: European countries are increasingly counting riders on paved and unpaved national routes (especially in Switzerland, more on that later). This has been a key tool in generating investment in the United Kingdom's National Cycle Network (NCN) and in French regional networks (for example, in Burgundy), and my understanding is that more of this will happen along the Rhine. In the U.S., we seem to be a long way away from establishing counts for cycle tourists. However, the good news is that cities like Portland, OR are doing more and more cycle commuter counts; as these techniques are refined, there is potential for transferring them to cycle tourism routes (and again, we can use some of the European techniques). Funding: Here is where the U.S. is really far behind. In Europe, there are consortia of governments funding route development and promotion (as along the Rhine) and there are governments investing large amounts in national networks (more than a billion pounds in the UK's NCN). 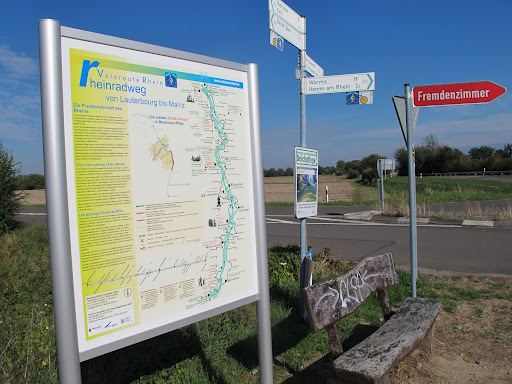 The European Parliament is investing in studies of bike tourism and its economics as well as in the Euro Velo continental system of bike routes (and even individual routes like the Iron Curtain). In the U.S., we have no dedicated national investments in national bike routes or bike tourism. We are scraping together some local grants (and thank goodness for Adventure Cycling members and donors who enable us to support the development of the USBRS!) and some states are stepping up their support for bike tourism (such as Oregon and Minnesota) but we are well short of the kinds of investment needed to develop and maintain a state-of-the-art national bicycle route system. We've made huge progress over the last eight years, with 41 states now working to plan and implement USBRs, but my ride on the Rhine and contacts with EuroVelo organizers has shown me that we have a long way to go in creating the largest official national cycle network on the planet.